Aerial of an oil spill at the Rosneft oil field Pyt-Yakh in Siberia, Russia. Copyright: Denis Sinyakow, / Greenpeace. We are near a town called Pyt’-Yah, in the Khanty-Mansi region of Western Siberia, which sits in the middle of the oil fields of Rosneft, measured by oil reserves Rosneft is the largest public oil company in the world. Khanty-Mansi is the oil producing capital of Russia, a country where hydrocarbons provide 25% of the national budget, as well as terrible inflation and total dependence on oil markets. We are in the middle of a large bog covered with thick black oil slime, there’s no way to keep your clothes clean here. This is the hidden side of the raw-material economy, hidden from the eyes of European consumers and careless oil money spenders in Russia’s major cities. Just a few hours before we arrived to Mamontovskoe field (one of 10 largest oil fields in Russia) a pipeline rupture occurred. Dozens of workers and machines are hurrying to amend the pipe so that they can continue production. The swampy soil under our feet is literally bubbling: toxic liquid from the broken pipe is spreading and the chemical smell is sticky and suffocating. 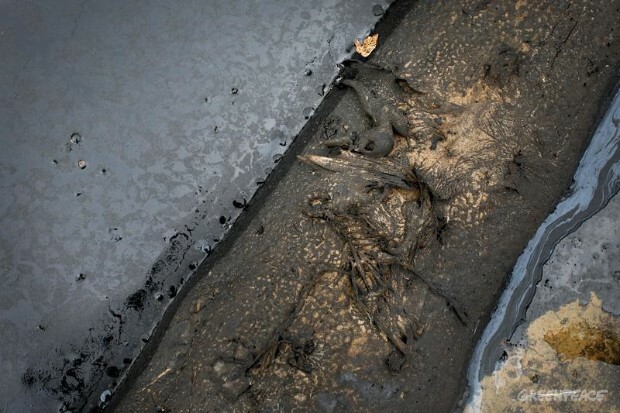 Duck bones in an oil spill near Pyt-Yakh in Siberia, Russia. Copyright: Denis Sinyakow, / Greenpeace. None of the workers pay attention to the enormous spill that is just 100 meters away. It did not appear today, oil has been leaking from a rusty pipe for several years and formed a black “lake” several hundred meters long that is expanding year by year. But these oilmen do pay attention to our appearance: two security cars approach and demand that we leave this “private area immediately”. They are nervous and keep muttering: “How did you learn about the accident?” In the Khanty-Mansi region where Rosneft has 2,700 leaks a year it’s easy to witness an accident. Here in the depths of the Siberian forests oil companies don’t need to care about their image. The government has failed to establish regular control and supervision over their activities, and most of the small accidents go unnoticed. For larger spills Rosneft is used to paying paltry fines. The Russian oil industry spills over 30 millions barrels of oil every year, that is equal to 7 Deepwater Horizon disasters per year in spilled oil. There are over 20,000 single accidents every year, half are Rosneft’s, making Rosneft the global leader in oil spilling. They leave other major oil companies, like Shell, BP, ConocoPhilips, and Chevron, far behind. 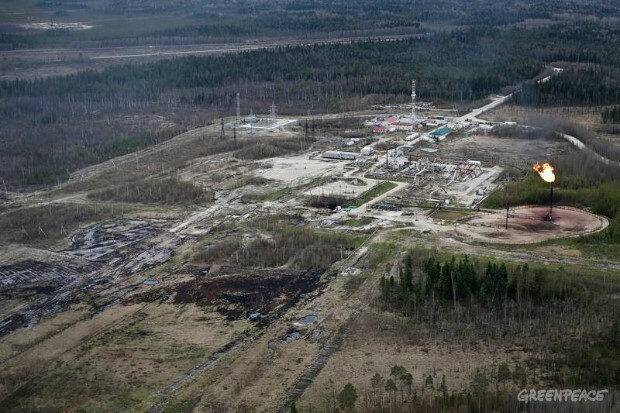 Watchdogs point out that 97% of pipeline ruptures in Russia occur because of corrosion, which occurs because of old age and misuse of equipment. Most pipes in Russia are over 30 years old and were never intended to last that long. We spent several days walking around endless spills. We saw pipelines just lying on the ground or even in water streams getting rusty with wet soil and snow; we saw pits left after repair works, filled with oil slime. 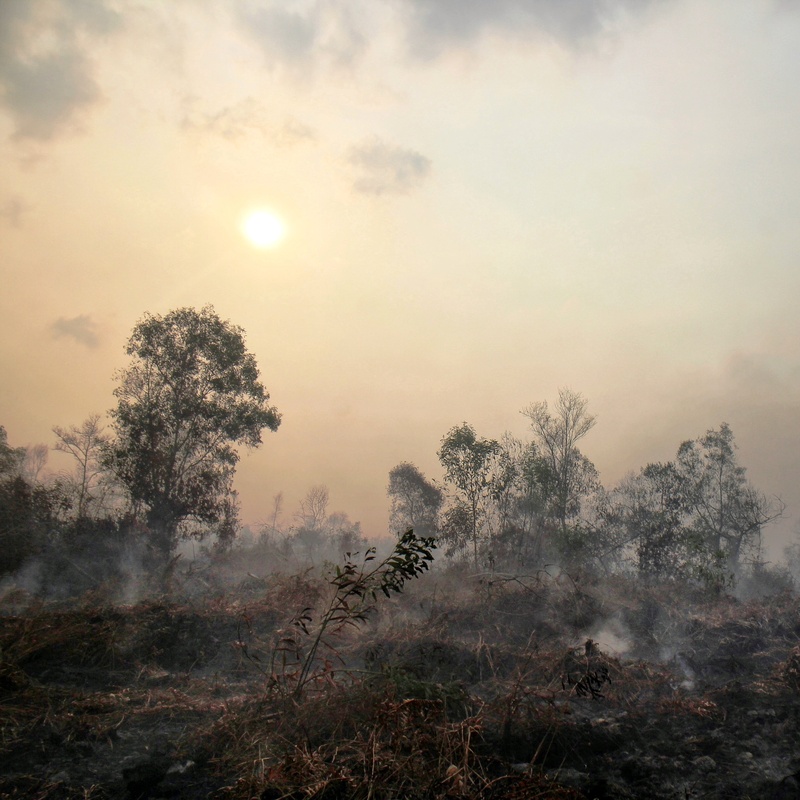 Thousands of hectares of forests are slowly dying from toxic contamination and fires, water basins shine with oil slick. Here are many dead birds and small animals. Locals say they saw dead elks in the middle of an oil-covered bog. Even if supervisors report an oil spill, it does not mean it will be removed. The company often just imitates the process of land reclamation, burying the oil under the soil and covering it with sand. After several years of such practice most of the natural vegetation dies off. And many generations will pass before nature recovers in these severe subarctic conditions. It took the oil industry just 40 years to devastate the nature of the whole region. This week we travelled several hundred kilometers through Western Siberia and did not see real taiga – only patches of pine forest, young trees appearing on vast clear-cuts and endless mires tainted with oil. Indigenous people of this area – the Khanty, Mansi, and Nenets are forced to abandon their traditional lifestyle. Surplus in oil production that the Russian state is so proud of means less game in the forest, no fish in polluted rivers, reindeer pastures replaced with roads and oil fields. This environmental disaster is the daily routine of this oil giant who is now rushing to exploit the Arctic. Instead of replacing its leaky, rusty pipes in Siberia Rosneft plans to invest billions of dollars into Arctic shelf exploration. With strong support from the government Rosneft has already received Arctic fields with a total area of over 1 million square kilometers and plans to expand further. At international conferences and top-level meetings Rosneft often talks about its advanced technologies and sustainable development of the Arctic. But we are here with our boots sunk deep in an oil spill and we can see how far from the truth Rosneft’s declarations are.